This deluxe edition of the New York Times bestselling The Sleeper and the Spindle comes in a beautiful slipcase, complete with gold foil artwork and gilded page edges. 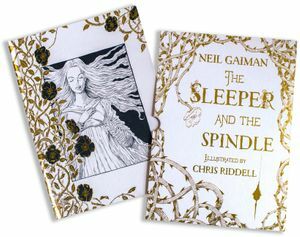 New York Times bestselling and Newbery and Carnegie Medal-winning author Neil Gaiman and Kate Greenaway-winning illustrator Chris Riddell have created a thrillingly reimagined fairy tale, "told in a way only Gaiman can" and featuring "stunning metallic artwork" (GeekInsider.com). This story was originally published (without illustrations) in Rags & Bones (Little, Brown, 2013) and then as an illustrated edition in 2015. This deluxe edition is a stunning work of art.